I am in love with this. I have to say that I have never been disappointed by any of Amy's Polishes. They are all really unique and beautiful. This is definitely in my top ten favorites. This is called Cop-A-Teal. 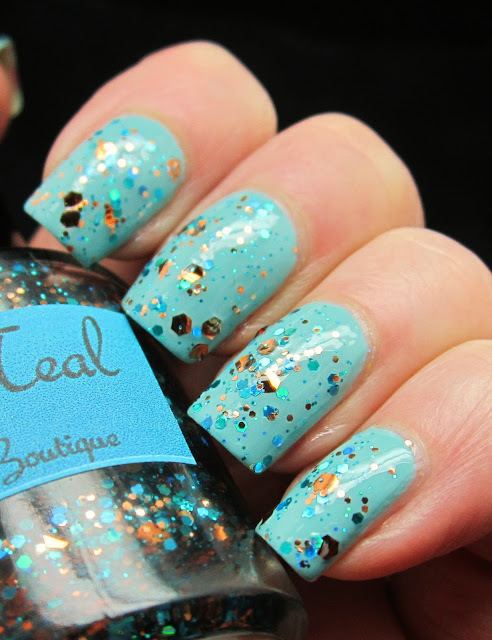 It is a combination of teal and copper colored glitters in a clear base. In case your wondering about the base color, I layered one coat of Cop-A-Teal over two coats of China Glaze For Audrey. Here is For Audrey on it's own. You can buy Cop-A-Teal from Amy's Etsy Store along with some other fabulous new releases. Keep your eyes open for some amazingly beautiful, very pigmented holo polishes in unique colors that she will be releasing soon. To check out a sneak preview of these holos, you can check out her facebook page. Gorgeous! I love the combination of teal and gold!